Graphic design software for creating posters, reports, infographics, and presentations. Venngage is a powerful business tool. The quality of my client visuals has increased exponentially! Pros: The most valuable aspect of Venngage is more than the software itself, but the amazing user support I get as a subscriber! I find the weekly emails from the Venngage staff alerting me to new ways to use the templates in Venngage priceless!! Those guides help me focus my thinking, give me great inspiration for how I can illustrate my message in a compelling way and increase my confidence in developing visuals. This service really sets Venngage apart from similar tools I've used like Piktochart, Lucidchart, etc. I have found that the concepts I've learned from the Venngage team, I can apply to other apps as well (e.g., Word, PowerPoint). I also like the variety of templates available, and that I can "deconstruct" a template and understand how the infographic was designed so that I can create my own version of it as needed. The way the templates are categorized really help to guide the user to the best visual to use for the message being delivered. I will be a long-time user of this software. Cons: I wish more of the templates were formatted for a standard letter sized page as often I'd like to include them as a part of handout or physical file of resources for clients. 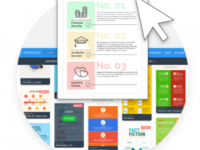 The long infographic templates, display the most information which is great for web-based sharing of information, but they are difficult to replicate if you want to share a physical version. Despite the number of icons available, I still encounter situations where I can't always find the right icon to illustrate my message and have to use other sources, e.g., Icon Finder, to identify the most appropriate visual. I do think the monthly cost of Venngage is pricey. I do recognize the annual cost would provide me with some savings, so I'll be exploring that but as Venngage probably realizes, for SB's managing cashflow if key so an large cash outlay for the annual subscription can be prohibitive when balancing that expenditure with other expenses. Venngage is easy to use, has a diverse library, and is a great value for the price. Pros: The templates are amazing. They really help to spark creativity and are easy to adjust to my particular needs. And since they are constantly adding new templates, I can always find something that works well for my project. I also love the icon library. They are so many icons to choose from and 99.9% of the time I can find exactly what I need without looking at other stock image websites. Lastly, the learning curve is not very long. I feel that I became proficient at using Venngage in a relatively short period of time and the results have been that my work looks more polished, more professional in a shorter period of time. Cons: I wish there were more alignment options. There is a snap to guide but I don't always find that as user friendly especially when I have multiple items on the graphic. I'd like to be able to select two or more items and then click "align to left" or "align to center." Also, it would be great to have a distribute horizontally and a distribute vertically option. This will allow me to ensure even spacing between objects. Overall: Professional looking materials. Better communication with employees using visual elements. Helps to increase their overall engagement in whatever process or concept that is being communicated. Pros: My students and I have enjoyed using Venngage for poster-making projects and infographics. There's a lot to like about it, especially since it's easy to learn to use and it's very user friendly. My students were creating in no time at all. Venngage offers of good selection of templates to choose from and they are well arranged and filtered when searching for a template type. The offered templates look good - they are well designed, simple, and clean. The templates are helpful in the classroom because it gives students somewhere to start - less artistic students don't have to stare at a blank screen; instead, they are given an idea or motivation to start from and edit. Editing and creating is simple with the drag-and-drop features and layout of the platform. Venngage also offers a good selection of images that you are allowed to use in your projects for free; however, you do not have the ability to upload personal pictures with the free version. Another great features is that it autosaves - this is great for a generation of students that is accustomed to Google Apps automatically saving, at all times. Cons: While I've enjoyed using Venngage for a few projects, I do have some concerns. For starters, you cannot upload your own images on the free version (a feature available with other platforms). Beyond that, you cannot download or export images as a PDF or PNG unless you have the premium version. Even though I like Venngage, this was somewhat frustrating to discover as I'd never experienced this problem with similar platforms. You can also only create 4 designs for free and all of these projects will contain the Venngage logo/branding. I must point out that my least favorite things about this software are all "free subscription" problems. From what I've read, if you purchase a subscription, all of my concerns are resolved. I understand - they are a tech company and they need to charge for the awesome product. I've just found other platforms with similar abilities that offer more features for free. I think it would be phenomenal if they'd consider some sort of teacher or education package, but as of now, this is too pricey for educational purposes. Overall: I have been pleased with Venngage and what it has allowed my students to do; however, I think the free version is too limited. Venngage has good `bones. All the key components for making my products `sing is there at a click. Pros: To my surprise and delight, your online support was immediate. I love that as I typed, a little message popped up to say that so and so was looking and waiting for my inquiry. This simple feature instilled me with confidence that a real person was at the other end, ready to assist. Another feature I really like is the vast array of options, across all your templates and icons etc. But even more than this is, I like your labeling system. It makes my searching so easy. The ability to turn on and off various features, such as the `grid is great. I can see whether my text is lined up before I print. This saves me time and money. I also enjoy the fact that I can take your template, but still make it my own. This flexibility again saves me time, but still allows me to personalize my product as required. I find your whole suite of features so intuitive to use. A big thumbs up from me so far. Bravo Venngage. Cons: I like your software, so the tone and intent of my following feedback is to encourage further potential improvement areas. I have two suggestions, based on my recent needs. First: when I save my designs, I would like to be able to copy and paste an existing design I have done and saved. At present, I only seem to be able to edit one of my existing designs. But sometimes I want to keep the earlier version, including its content, but add new content for another client's purpose and save this version too. Second, on some of your templates, I don't seem to turn on the grid feature. Third, I do like being able to embed a hyperlink to, for example, a website. What I want to do is use this feature, save as a PDF and email the PDF doc to a client. Eg a personal letter, with hyperlinks. But unfortunately, unless the letter is published online, for all to see, then this is not possible. Pros: So far, our marketing team has been relying on Venngage almost exclusively for day-to-day graphic needs on all kinds of collateral. We'll be hiring an in-house designer soon, but Venngage has been a solid go-to for over two years. I myself am not a graphic designer by any means, but this tool has helped me put together some really polished, stand-out content. Even with a designer on board, I can still see myself using Venngage here and there for stuff I want to put together quickly on my own. It offers a nice set of icon/design options. The templates are good starting points as well, or at least make decent inspiration if nothing else. I find them difficult to customize though and prefer starting with a blank canvas most of the time. Cons: Sometimes it's a bit laggy, but you can't really complain for a subscription. Our needs are a bit niche so I'm not always able to find the kinds of icons or graphs I want, but it's usually possible to work something out with what's available by getting a bit creative. Overall: Helped us - in-house marketing team - design polished, stand-out content without a graphic designer! Images are worth a 1000 words. Venngage allows us to create infographics to visually say something. Pros: The style of using infographics to convey a message becomes more easily manageable and understood with the help of Venngage. The templates make it easier for us to generate the best way to convey the message. In our modern times, people tend to pay attention to visual graphics more than words. We took simple things like packing list, and turned them into visual infographics to increase "readership". The free clipart/images are modern and not cheap looking. They match and are themed (similar design) so we can create professional looking infographics. The infographic builder is what-you-see-is-what-you-get, so as you design the image, you can see what the final product will look like as you go. Cons: There are been several times when I created an image using a certain size page layout, but then wanted to change the size. The process was a little cumbersome to reformat into different sizes and I think it could be made easier. Sometimes the grouping feature (grouping multiple items together to move) can be difficult to use when items are layered. Overall: We have lots of boring, but important, things to get across. Since people tend to avoid reading lots of words, we needed a way to convey the point with images. Venngages easily creates easy to read infographics. Pros: The varied options it gives is great along with being up-to-date with trends. For example, Valentine's special templates for the month of February. Secondly, the fact that it is so customizable right from the colors of the gridline to the font of the legend makes it likable. It's made my life easier with the graphs. I used to use powerpoint and excel for making charts/graphs and it was a pain. I also like the options available in icons, makes it quicker for me to not go to a third party like iconfinder.com. I used to use that software to fetch icons and freepik for vector files and merge them in Adobe Illustrator. This software solves all the 3 purposes. Lastly, I love the chat support. People are quick in replying and help solve my queries proactively. Cons: I have yet not figured out how do you undo changes (3-4 layers backward). I am a Safari user and Venngage works better on Chrome so if that could be leveled up, it would be great. Another thing that bothers me is the fact that Venngage uses only google fonts. If I want to export any other font, I do not have an option. Because of that, I switch to Adobe when using other fonts. I have really enjoyed using this product. It takes a while to get into to learn its capabilities. Pros: I really enjoy the icon library. I wish the icons available particularly people increased to include more professions, different ages and different races. Cons: Please expand the icon library (add more people). Also the swatches (number of colors you can save under your brand) is too limited. I work for different companies and I need more colors to save. The upload function for photos is abit cumbersome -> I wish I could just copy a photo from a site or my computer and just paste/drag it. When creating documents that are multiple pages, I find it really annoying to have to click through the little up and down button-> it would be helpful to have an adobe style scroller. The downloading of PDFs sometimes takes too long. Furthermore, sometimes when I download a infographic as a pdf, and I try to edit small typos in adobe> the fonts almost always are janky. It would be helpful to have fonts that are easy and compatible. I wish I could have different pages to have different background colors. Currently I have to create a large box and I have to expand it to cover the entire page and I have to lock it in. I use this software for a variety of purposes in analytic learning reports for executive teams. Pros: This software is easy to use, modify, and create unique designs. It has multiple export formats as well, which I appreciate. The colors are bright but not obnoxious. There is a great variety of imagery to choose from and from lots of different industries. I really like that I can use Venngage to create an image as detailed as I like, and simply export as a PDF for someone else to insert in their documents or use as they like. I've had a great deal of success using the charts feature, particularly in learning applications. Cons: I do not like how some features of this program become tricky to modify, particularly the word maps. When you don't have actual counts of words to create a word map, you have to kind of guess how many times it would appear and adjust the number multiple times to make the image appear as you wish. Overall: Venngage makes creating detailed, informative images very easy. I also create longer infographics for posting and telling stories with data. I mostly use Venngage to create detailed home page images for our LMS and in the creation of e-learning. It just made the image-creation process much easier. Pros: The templates are a great way to start an idea off - and you can use bits from different ones to create your own unique design. I often have to make more than one design to show the groups we work with and being able to make my own templates has been really useful. Cons: Being in the UK the default 'letter' size for lots of the templates nearly always needs changing as the 'A' range is much more popular here, I have also found I need to 'oversize' work so when I down load it for printing the resolution is better. I have been using Venngage for 4 years now, and I LOVE it for all my work. 3. The various ways flags are presented - I use the thumb flag icon so much! 4. The ability to download in different formats. Cons: The slowness of going back to previous edits. I have to click and wait for a load to get back to the previous design. Also, moving the boxes around, whether it's text or image, is sometimes hard. Overall: I am able to do all my work, and we at CARE have used it for everything from conference bag designs to big timelines that we use at huge conference meetings. The charts have helped us with our infographics especially since previously, this used to be so expensive. I use it often and train our teams on using it in East, Central and Southern Africa but now I have been asked to train other parts of the organization to use it too - so in two weeks I am running a training for our Asia countries. Pros: It's so easy to use, and the live chat people are so helpful. I love the versatility as you can upload your own pictures or use theirs, plus they have a load of icons you can use to create really professional-looking graphics super fast. You can also make graphs and basic polls really easily too. Cons: As I use it a lot, I often think of features that would really improve the software if they were added. I suggest them to the live chat people but they rarely actually happen, which is a shame. Pros: I appreciate the multiple templates and tools that simplify the process of creating a really awesome infographic. It takes minutes to create pages and documents that it would normally take hours to do or that I would need to outsource to a graphic designer. For the most part, I have found it simple and easy to use and pretty powerful. This ease of use combined with high quality output makes this a great tool for people like me who are not designers, but need something that create high-level output without enormous amounts of effort. Most recently, I used Venngage to create our annual report and I couldn't have been happier with the professional quality of the final product. Most importantly, it took less than a few hours of total time, including the creation of multiple chats and graphs. Cons: I did find that there is a page limitation when creating a multiple page document. So, for our annual report, I had to create separate documents save them out as PDF, then use Adobe Acrobat Pro to combine them into one PDF. While this created an extra step, it was relatively easy to do so I was terribly bothered by it. Venngage is great for making exciting looking internal emails at work. I use it nearly every day! Pros: I love that I'm able to upload my own images and logos to really customize it for my needs. I also use the "copy" feature a lot, where I'll duplicate one of my past designs and edit it from there so I'm not starting from scratch. The grouping feature also makes it easy to move around whole blocks of images and text so you're not losing your spacing/placement, but can move it all up or down if you wanted to add or take away extra space. Cons: I wish there were more font options, or the ability to upload a font. Sometimes I feel limited with the options available. Pros: I can do really great looking infographics, pictures or even CV-s with this platform. I use this for my personal life and my work as well, almost every day and I still love it even after years of use. Cons: It takes quite a bit to get used to it, to find your way around. Eventually you realize that every functionality you need is there, it's just sometimes confusing to find them. Overall: My great job thanks to the CV i made with it. Pros: My favorite part of Venngage is the ease of use. It is really simple to create something unique and professional grade. I use Venngage to create inforgraphics, cards for social media posts, and photo content for email blasts as well. Once you get the hang of it, it's really easy to put together designs. I often use the same templates I have created over and over again. The free images are a definite plus as well. Cons: The thing I like least are a few of the technical issues. I wish that I could import higher resolution images in my upload and export into even higher resolution for the finished product. Sometimes diminishing the quality of the photo in order to upload it into the Venngage system means that I cannot create posters or larger-scale images because of the pixelation that would result. Overall: It saves me a lot of time that I would have otherwise spent working in Adobe. 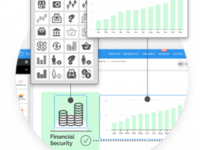 This tool is very helpful for creating captivating graphics to tell a data story. Pros: The software is super easy and intuitive to use. There are many aspects you can customize (such as adding your own company colors to the pallet - makes reuse a super easy). I like the templates for generating new ideas. The new snapping features works great. Overall, my favorite part is the customer service. I have to admit, I avoided the "Chat with us now" box on the side - thought maybe it was a bot. However, I really needed help one day and I used it. It is a human (or the most realistic AI on the planet). The response was immediate and provided me with exactly what I needed. I have since used it several times with the same great results. In this day and age - that level of customer service is exceptional. Cons: There are few things I would like to see added. Icons currently are limited to 2 colors for fill. It would be great to have the ability to do more than two colors. Also, it would be great to have more options than google drive for connecting data directly to the tool. Currently I have to manually update charts that I reuse regularly. Overall: My presentation look sharper and more professional. In addition, I have been able to create graphics that communicate challenging concepts in a clear and simple way. People finally read my reports! Pros: I first started using Venngage to create reports on customer insights gathered from interactions with the customer service team that I manage. I used to use excel and no one seemed to pay attention to the boring report. As soon as I started using Venngage I had so much more engagement. I now use Venngage for so many things from reporting on KPIs to making beautiful posters. There are a ton of ready to use templates that are beautiful and they are constantly posting new ones. I have zero graphic design experience and am able to create professional looking infographics that attract the attention they need. I also love the helpful tips and entertaining infographics I receive through email from Venngage. I receive a ton of emails from vendors and I actually open these ones. Cons: When I first started using Venngage there weren't many business reporting templates available but they have grown. I like the new power point templates that are available. I wish it was easier to brand an existing template. Pros: The templates available are spectacular! A great help when getting started on a project and easy to edit. Cons: I really wish there was a way to share the original/native files with other users. We create infographs for some of our clients and they don't have access to them to be able to update and manage them themselves. Pros: The interface itself is fast, fresh and well laid out. Minimal clutter when choosing your desired template category and good grief there are plenty to choose from. I've only had to speak with support a couple of times and both times it was a fast and detailed response. Cons: I don't use it as much as I should...As I've mentioned there's plenty of good stuff but the design interface is frustrating at times. There is no right click function, it is a nightmare trying to manipulate lower layers (need to drag top layers out the road first) - -just "niggly" things that spoil a feature rich SaaS based infographic design system. If these things could be sorted, not only would I use it more I'd also be inclined to refer others to it too. Overall: The ability to disseminate information in a clear and easy to understand format to my non-technical target audience for my technical services and training products. Venngage is what everyone looks for: simple, user-friendly and easy to use! Pros: -UI is simple and clean meaning functionalities are organized and easy to find. - There is a ton of premade templates, so if you are in a hurry and need something polished as soon as possible you can do it in a matter of minutes! - Venngage is a platform that is regularly updated, so new templates, icons, and editing tools are constantly added. - The customer support is super helpful and responds almost immediately! Every time I contacted them, my issue was solved! Overall: It is the best infographic maker out there! I am not sure I can list any! Venngage gave me the best experience I had with any other infographic software and believe me I tried many, though it performed all of them! Very easy for non-designers to use. Pros: Massive library of templates helps spur creativity so there's rarely a need to start from scratch. Built in artwork-icons, photos, fonts-is great, as is the ability to upload photos and art. Cons: There is no align/distribute functionality, so this is a manual process. Adding this functionality would greatly speed up the process. 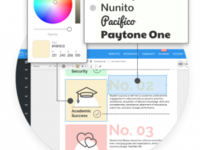 Overall: Professional quality design for a variety of marketing channels, including social media, online communication, and P-O-P.
Pros: I like that you can find templates for almost all the things you like and need. You can use them as they are, just changing the text, or you can modify them as you like. I had a Premium account, therefore I benefited from all of their specifications. I mostly enjoyed the Interactive PDF as it comes very in handy when you need to present some information and send it to your clients. I also liked that they have a vast number of icons, photos and other that help you instantly :). You have everything you need just a click away and that save you a lot of time. Cons: I did encounter some bugs along the way, regarding text, resizing and placement, but the Customer Service was really helpful and now, I did they got rid of all the bugs, as they had some upgrades and modifications. I have to mention I had the Premium Account, therefore I had priority. Overall: Really nice and simple to create infographics and presentations that really impressed the viewers. Super user-friendly and adaptable for this small non-profit office! Cons: - Although price point is affordable with our current version, it would be nice to be able to sort projects more efficiently. Something for us to strive for in future budgets if we decide to upgrade to the 'business' version. Finally a modern, crisp, and professional infographics tool that allows people to present material. Pros: Modern presentations that are well thought out and obviously produced by a talented staff. Easy to add your own icons, logos, photos. It seems the team is truly engaged in their work and listening to customers. Fun. Rewarding. Customizable colors that are cool and not just primary based. Option to use free if you just need a little something. Easy to edit text and material. Easy to add custom title to saved work. Visual icon for saved work and an option to preview or edit. Cons: Saving and uploading files in a public manner is uncomfortable, then u have to pay to save in other ways which feels a bit like a bait and switch. Pros: My company has purchased Venngage for Business and it is a tool I use at least weekly. It is such an easy way to make basic graphics for social media, infographics and charts that are aesthetically pleasing. There are also many free images that you can access through the paid subscription. Cons: When we first purchased the software it did take a while to get accustomed to the editing tools but once you catch on it's very easy. I would also like it to be easier to zoom in and out on large files and for them to bring back a tool that defined the document's boundaries. Overall: I have been using this product for three years and still use it regularly. I would definitely recommend to anyone who does not have graphic design experience as an easy means of creating compelling visuals. Pros: Although the site is poorly lacking in images of people of color (or body parts, such as hands, that reflect people of color), the graphics are otherwise very cool, and the templates are attractive and easy to use. Cons: Most of the images of humans or body parts are of white people. I will leave this software if this is not improved. Also It's difficult to make simple shapes like lines that don't expand in width when made longer. Overall: I love this product and would recommend it highly if there were more images of people of color that could be used in graphics. For example, look at the images that come up when you type "hands" in search. The only brown hand is one holding a white hand. The images don't represent my clients or the world around us. I would have rated this product a 10 if not for this very important issue. Pros: The icons, pictograms, and ability to set brand colours make this pretty easy to use. I love the snap to guide as well. The chart feature is awesome. Cons: I can only have 100 images in my upload folder, can't download as a print PDF, can only view one page at a time in multiple page designs, and the site doesn't automatically open new designs in a new tab. Some elements are pretty limited and I don't find this software particularly intuitive to use - I go to another programme for some designs as I can play around a little more and make more attractive designs. Overall: I can design simple infograhpics myself rather than going to a graphic designer. I can import brand details (logos etc) which means that the designs I deliver fit with the look and feel of the rest of our collateral. Pros: Unbelievably versatile and surprisingly intuitive to use. Does the job of multiple applications in one easy to implement and integrate program. Overall: Versatility - a program that can seemingly do it all. What's not to love? The price feels a little steep, and at times I notice little things that I wish it had, but all their other features provide sufficient compensation so it doesn't have a big impact. Pros: Range of templates to enable me to create good quality content. Continuous updating of content and really helpful, informative & instructive blog to help me get to the next level. Excellent customer support for when I get stuck. Cons: One or two key features (automatic alignment of objects) have been in development quite a long time. The jump to business pricing is too high for a sole trader like myself. Overall: The opportunity to create professional quality content both for my own website and for company reports which would have been too expensive to commission otherwise. Pros: Venngage offers a fairly similar user experience to Canva, which is a big draw; it's easy to use, has gorgeous premade graphics, and enables simple manipulation to create custom graphics without needing a designer. The offerings are wide, which I really enjoy--you can create a lot of different things quickly and make them all look beautiful. Cons: There's something about the interface that frustrates me, and I cannot put my finger on it. I find myself not finding exactly what I want/need, or getting frustrated with the UI pathways. Like I said, I prefer Canva for things like this. Thanks again for taking the time to leave a review, we really appreciate it! Easy to use to create engaging non-profit media materials! Pros: The interface is so easy to use that I can allow other teammates access to projects and they can make changes and updates immediately without my having to train them. There is a huge variety of templates that we have been able to adapt for our needs and it has made a difference in the turnaround time for our projects. Cons: There are some page limitations on templates that make them a little difficult to adapt for our uses. We have worked around this by making multiple copies that are continuations of the documents, but it seems like an easy fix. More native icons for pictographs would be great - we are an animal shelter and the animal and medicine related stuff is a little sparse. Overall: A quick and easy interface for media projects with a lot of native material to work with so we are not designing from scratch. Saves us so much time and effort and helps us turn out polished projects that reinforce our professional image. Venngage has allowed me to create impressive and striking infographics that impress my clients. Pros: It is easy to use. I'm not particularly computer savvy. And I'm not a designer. 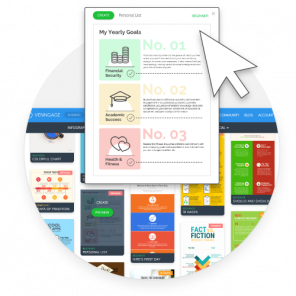 But through the use of the many excellent templates that Venngage has on its site, and by observing how the 'professional' industry creates infographics, I can make smart looking images in a short period of time. It is easy to resize the graphic, and easy to download as a PDF or PNG. Cons: The map tool can sometimes feel a little awkward to use, especially if you want to use just a section of that particular map. Pros: I am not a graphic designer, but needed an easy platform to design graphics for our company. Stumbled upon Venngage and it is incredible. Super easy to use. Their templates are plentiful and there is always something there for inspiration. I have recommended this to a bunch of other folks in small business looking to increase their graphics online in a cost effective way. Cons: Can be touchy with controls, but you get used to it after woking with the platform after awhile. Pros: Strong ROI for our firm. Customer Service is very responsive and anytime I had an issue it was resolved same day. The program is overall, very easy to use for a novice marketing person and is irreplaceable for me at this time. Cons: More options to really make my designs look more professional. Sometimes there is a little bit of a generic look and I feel like I don't have access to all of the graphics I would like to have. Overall: Custom corporate internal and external marketing pieces that I can create in one day. The templates are extremely helpful in assisting me with design and how to layout my ideas on paper. We can customize materials for our clients to distribute to their employees. Pros: The education version gives students a lot of features and tools. They have professional tools for a price that is reasonable for a whole class of students. It's great that students do not have to for out additional money. Cons: I think that Venngage may have downsized the number of students allowed per class since I first started using it. Since one subscription no longer covers a whole class, I have cancelled my subscription in favour of using free infographic apps. They're not as complete, but the cost was too much. Easy to use, flawless end results! Pros: I use Venngage for presenting numbers at work, for cute Facebook posts, for greeting cards well, for almost everything. And I always get compliments for the flawless end result. I've shown Venngage to several friends who also fell in love with it. Perfect software if you work in marketing as I do. But I would also recommend it to people in non-creative fields. Spice up your reports or whatever it is! It'll be easier for the reader to take in the facts. Cons: I really miss the option of adding fonts. The selection is okay, but some companies demand certain fonts. Overall: Easier to create awesome infographics that stand out! Pros: I could start with a tutorial(and a whole library of them), so I didn't get frustrated trying to do something, and not having it work. All the templates, and ranking them from Beginner to Advanced. Cons: There's not much I don't like. I found it difficult to remember where to find and how to do the spread sheet at first. If I had just done the tutorial, it would have been fine. Overall: Easy to put images/infographics on my website and Linked in. The ebooks templates make life really easy. Venngage is a well designed software, very easy to use. Pros: The templates look very professional, so it's a good start for your infographics, ebook covers, blog banners, etc. There's a lot of icons, images, fonts and colors to choose from. Everything is very easy to use even if your not a professional graphic designer. Cons: The only complaint I could think about is that with a Premium account, you cannot arrange your work into folders. So it's a bit hard to find past designs. It is one of the business features though. Overall: As part of our blogging effort, we wanted to offer nice visuals like infographics or just blog banners to make our blog more attractive. Venngage has been an easy and affordable option to do so. Pros: I like styles and designs. The finished products look like a real GD has produced them rather than me! I like I can add my own photos and images. I like chatting to the live operators, they're really friendly, quick to respond and helpful. Cons: I find it frustrating I can't drag an image in one direction without it scaling up. Sometimes I want something a little taller not wider. Sometimes things don't always exactly align or snap to. Although I think there may be a bit of user error in this one...I've recently found the show grid that might help! I would like some of the people icons to be more multicultural, they are all peach coloured. Overall: High quality products for small price. Still regretting that I didn't upgrade to Business for your Black Friday deal. Polished results. Amazingly Powerful! Allows me to work smarter, not harder. Pros: Extremely easy to learn and use. 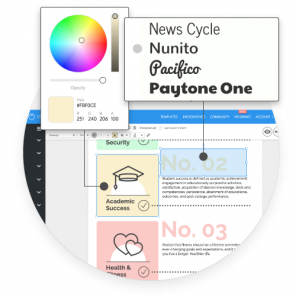 There are so many different template options that visually show the capabilities of this software. I do a lot of marketing/advertising and this program allows me to crank out visually appealing graphics within minutes. Cons: A limited number of photos and icons that are not always able to be manipulated. There are some icons I want to change colors and am unable to. Pros: As a graphic designer I thought this was for those without the ability or software to design flyers. After using this one time, I realized how powerful and fast it was to use. I use it in place of my expensive Adobe software for flyers now. It just make sense to use it since it has so many features already built in. Cons: It has so many built-ins already, but because I use this so often, I would like more. I would like a feature built in that has pre-designed header backgrounds as well as more shape options. Overall: This is a super fast way to get a professionally designed flyer or other marketing piece ready to go. I haven't had any problems with this platform. Pros: I like that customer service is so great, and it looks great! Every question I have had has been answered promptly. I like that the graphics look so great, and that I can customize nearly everything. Cons: I can't think of anything to really dislike. It's done what I needed it to do. I use this program to create an annual report, and sometimes it doesn't translate well between venngage and the printer we use, but we have been able to resolve little glitches. I use Venngage to build infographics for clients as part of social & content marketing strategies. Pros: I love how easy it is to export and view infographics, at any stage of development, as PNGs, PDFs and even interactive PDFs (with clickable hyperlinks). If something's not right, you can just tab back to the active editor window, make changes and export again. Iterate to your heart's desire! Cons: Every once in a while, for reasons I can't explain, some detail of design (mostly to do with fonts, I suspect) will manifest as just a little "off" in the export file format. Everything will render in the output exactly as it appears on the editing screen, except - mysteriously - for this one thing... It's not the end of the world, as you it can be resolved through trial and error; however it can be irritating, and this remains my one complaint about the platform. It has made a big difference in how I present information at work. Pros: There is a template for everything and they are easy to tweak and customize. Plenty of font choices. 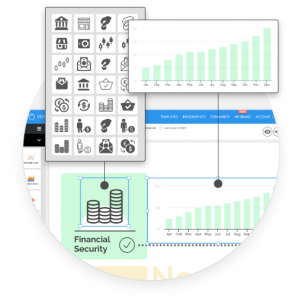 It is software designed specifically for infographics, so there is no clutter and no unnecessary features. Cons: There is no gradient option yet for background colors. Sometimes I can't find a font I am looking for. Otherwise, no cons! Venngage has been an incredibly useful tool for both work and school. Pros: This software is easy to use. You can make very professional looking infographics in a short amount of time. There are plenty of templates to provide inspiration. I work in a school and I have been able to create displays that can grab attention and disseminate information effectively. The price isn't bad either. Overall: The infographics I've made with Venngage has made my work more noticeable. Pros: I can't afford a graphic designer in my small nonprofit and love the look and feel of the final products. The templates are awesome! I get compliments from the public and funders regularly. Cons: I wish I could use the product off-line. It would be helpful for tweeks and updates online. Their than that, the product is wonderful! Thanks for the templates. Being a visual person I love using Venngage for everything from monthly reports to lead magnets. Pros: Venngage is easy to use drop-and-drag, the graphics and icons are many and varied, and what you don't find as part of the software can easily be imported. Support is second-to-none. Cons: There's not much I don't like about Venngage. I suppose if the Pro package was cheaper, i'd be using it. Overall: All the complicated ideas articulated simply, visually and published online. With Venngage, you can design pretty much anything! Pros: Venngage is very versatile and can be used to design pretty much any type of graphic. I started using it for work (creating annual reports for nonprofits to send to their donors) and now use it for lost and found flyers, dinner party menus, resumes, and much more. Cons: Pretty much perfect, but I'd love to see more sophisticated color options, like a fading/ombre. Also very occasionally there are elements in the pre-made templates that can't be deleted, which you don't notice until it's too late.